The Syracuse University Art Galleries is pleased to announce a panel discussion featuring the five artists participating in the current SUArt Galleries exhibition, Poetry of Content: Five Contemporary Representational Artists. The discussion will be presented on Thursday, March 3, at 7:00 p.m., in the Watson Hall Auditorium at Syracuse University. Organized by David Prince, Associate Director of the Syracuse University Art Galleries and co-curator of the exhibition, the panel is presented in conjunction with the Syracuse University Humanities Center in the College of Arts and Sciences at Syracuse University, organizer of the 2015 Syracuse Symposium™ on Networks. The panel includes Tim Lowly, Joel Sheesley, Robert Birmelin, Tim Murphy, and Gillian Pederson-Krag. Their conversation will be moderated by exhibition co-curator Jerome Witkin, also a well-regarded artist and Professor of Art in the College of Visual and Performing Arts at Syracuse University. This presentation will enable the five artists to share their thoughts on aesthetics, choosing subjects and media, and how their work relates to the contemporary art scene. Ample time will be reserved for students and others in the audience to offer thoughts and ask questions of the participants. This event is free and open to the public. Parking for the event is available on a first come first serve basis, in the Q4 parking lot. Please visit parking.syr.edu for further details. 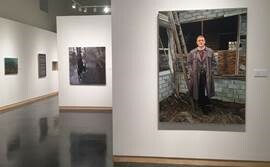 The SUArt Galleries will be open for visitors to view the related exhibition until 8:00 p.m. Complete information and related programming is available by visiting the website at http://suart.syr.edu/. Robert Birmelin was born in Newark, New Jersey in 1933. After finishing his studies at Cooper Union, Yale, The Slade School of Art at the University of London, and the American Academy at Rome, he settled in New York in 1964. Over the years he has had fifty one-man shows, including many in New York City. His work is included in 37 public collections, including The Metropolitan Museum of Art, the Museum of Fine Art, the Brooklyn Museum, the Hirshhorn Museum and the Syracuse University Art Collection. He has received seventeen scholarships and grants including a Fulbright Scholarship in 1960 and National Endowment for the Arts grants in 1976, 1982 and 1990, and the Carnegie Prize in 1987. He has been a visiting artist at ten universities and colleges, and since 1964 he has taught at Queens College of CUNY, New York, as a full professor since 1974. Chicago-based artist, curator, musician and teacher Tim Lowly was born in Hendersonville, North Carolina in 1958. As the son of medical missionaries (his father was a hospital administrator), he spent most of his youth in South Korea. He attended Calvin College and received a BFA degree in 1981. In 1981 he married Sherrie Rubingh. Their daughter Temma, born in 1985, has been a central presence in much of Lowly’s work. Since 1995 Tim has been affiliated with North Park University in Chicago as gallery director, professor, and artist-in-residence. He is represented by Koplin Del Rio Gallery in Los Angeles. Bill Murphy was born on Staten Island, New York, in 1952. He attended public school there, and later, Brooklyn College, the School of Visual Arts (BFA), The Art Students League, and Vermont College (MFA). At the School of Visual Arts he studied with, among others, Jim Kearns, Herb Katzman, Marshall Arisman, Louise Bourgoise and the illustrator Robert Weaver. Bill Murphy’s work is included numerous collections worldwide including The British Museum, The Brooklyn Museum, The Library of Congress, The New York Transit Museum, Westinghouse Corporation, and the Syracuse University Art Collection. He has taught at Wagner College on Staten Island, New York since 1984. Gillian Pederson-Krag attended Rhode Island School of Design for her undergraduate studies, and Cornell University for graduate work. Initially an abstract painter, Gillian found her calling as a representational artist in her senior year at RISD. She then taught herself observational drawing and painting using groups of small objects arranged in still life compositions. Eventually, landscapes entered her repertoire and included scenes of the area around Ithaca and later, the beaches along the West coast near Santa Cruz. Joel Sheesley graduated from Syracuse University with a BFA in painting and drawing in 1972. He continued his education at the University of Denver where his graduate thesis on abstraction helped him earn an MFA. He continued to paint abstractly for several years but eventually found the style unable to meet his aesthetic interests. He turned to the figure and incorporated them into ambiguous suburban surroundings that were, in fact, his Wheaton, Illinois neighborhood. His style has evolved to a point where a recent series of puddle paintings blend abstraction’s interest in planar flatness with scenes of his rutted driveway after a rainstorm. An active artist and exhibitor of his work, Joel currently shows his work at gescheidle in Chicago. Sheesley received Wheaton’s Senior Scholar Achievement Award in 2000 and an Illinois Artist Fellowship Grant in 2002. 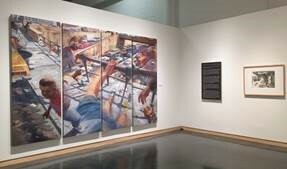 He is currently a Professor of Art at Wheaton College, serving on the faculty since 1974. The SUArt Galleries strives to provide the best possible environment for art appreciation and scholarly development. No photography will be allowed in exhibition spaces. For approved, press-ready images, visit the exhibition website. The SUArt Galleries, accessible through the Shaffer Art Building on the SU campus, enhances the cultural environment of SU and the Syracuse area through meaningful educational experiences and encounters with the University’s permanent collection and traveling exhibitions. It is the main campus venue for the visual arts and home of the University’s extensive permanent collection. The facility hosts a variety of temporary and permanent exhibitions throughout the year. The SUArt Galleries is a member of SU’s Coalition of Museum and Art Centers (CMAC).